Today, I'm reviewing Warner Archive's new re-release of the lavish costume drama, All This, and Heaven Too (1940), starring Bette Davis. The Stars: Bette Davis; Charles Boyer; Barbara O'Neil; Jeffrey Lynn; June Lockhart; Virginia Weidler. Source Material: A 1938 historical fiction novel by Rachel Field. Awards: The Letter was nominated for three Academy Awards: best picture, best supporting actress for O'Neil and best black and white cinematography. Plot: Young governess Henriette Deluzy-Desportes (Davis) is hired by French nobleman the Duc de Praslin (Boyer) to educate and care for his four children in mid-19th century Paris. While Henriette is adored by her young charges and the Duc, the unstable Duchesse (O'Neil) becomes insanely jealous of Henriette's close relationship with the family. It soon becomes clear that she will take drastic measures to both remove Henriette from the family and ruin her reputation. Backstory: Warner Bros. acquired the rights to Field's historical fiction novel, which was based on real events involving her great aunt, after the runaway success of independent producer David O. Selznick's adaptation of Gone With the Wind (1939). 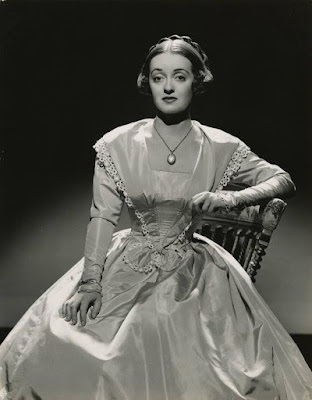 Boyer was always the first choice to play the lonely Duc de Praslin, but producer Hal Wallis considered Helen Hayes, Miriam Hopkins, and even Greta Garbo before settling on Davis. Warner's lavished $1.3 million on the sets -- there were 65 exterior sets and 35 interior sets outfitted with genuine French antiques -- and 35 elaborate costumes for Davis, which cost an estimated $1.000 a piece. Charles Boyer and Bette Davis in a production still from All This, and Heaven Too (1940). Why Bette's Great in All This, and Heaven Too: Bette's performance as Henriette doesn't have as many fireworks as the usual Davis tour de force, but she is magnificent throughout the film portraying an essentially lonely woman,who has learned to mask her emotions through a calm exterior. Litvak and the great cinematographer Ernest Haller make the most of her beautiful and expressive eyes throughout the film, especially in several key scenes where she is looking out the window during a snowstorm. 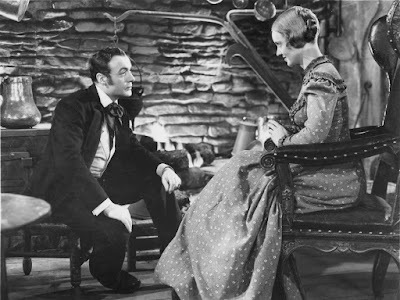 Best Performance Other Than Bette: Boyer, who once again proves his romantic leading man chops by making an essentially unlikable character sympathetic to the audience. Honorable mention goes to Lockhart, who turns in a sensitive performance as the oldest Praslin daughter, and the great character actor George Coulouris who stealthily glides around the Praslin mansion as a devious valet. Best scene: Henriette, contemplating her troubled future in the Praslin household, steps onto a snow-covered balcony. Davis' beautifully restrained performance in a sustained closeup is a lesson in movie-star acting at its finest. 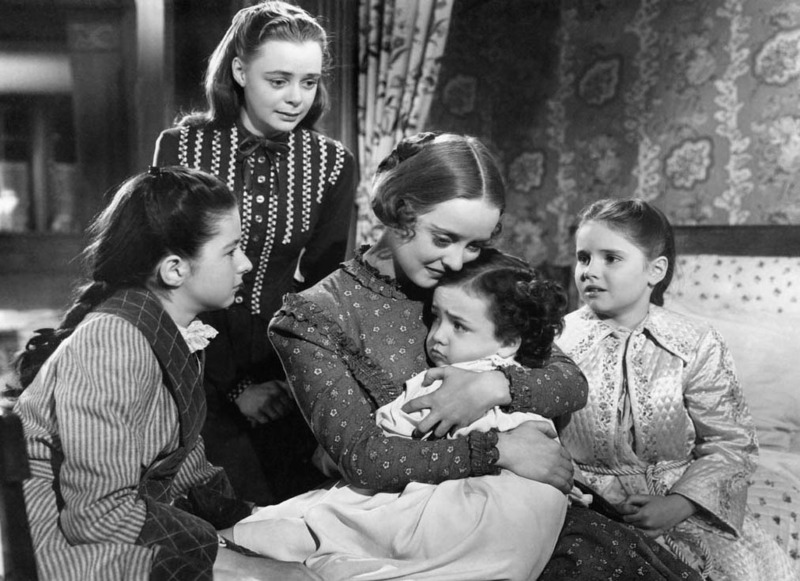 A production still from All This, and Heaven Too (1940) featuring Virginia Weidler (left), June Lockhart, Bette Davis, Richard Nichols, and Ann E. Todd. Fun Fact: Davis reportedly did not recognize Boyer the first time he appeared on set and tried to have him thrown out. The Critics: All This, and Heaven Too has an 83 percent fresh rating on Rotten Tomatoes and Leonard Maltin writes that "the stars do well in an elaborate filmization" in a three star review for his Classic Movie Guide. 1. Boyer and Davis. These two don't seem like a natural onscreen pair, but they actually have a great deal of chemistry together while acting out the tortured love affair between the Duc and Henriette. 2. Cinematography. Ernest Haller's gorgeous black and white cinematography in All This and Heaven Too is a work of art. His use of candlelight in the many nights is especially stunning. 3. Cute kids. The child actors who play the Praslin children all turn in solid performances, but it's hard to resist the curly-headed charms of little Richard Nichols as the youngest child. 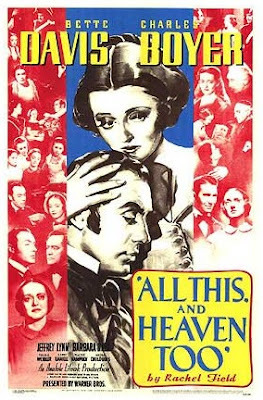 Availability: All This, and Heaven Too is available on DVD from Warner Archive (link below). The movie will air at 6 a.m. Oct. 2 on TCM, and it is also available on video on demand. DVD Extras: A Warner's Night at the Movies package that features a trailer for Dr. Ehrlich's Magic Bullet (1939); newsreel footage of Ed Sullivan crowning Mickey Rooney and Bette the king and queen of Hollywood (it's a really awkward trio); a Technicolor short, Meet the Fleet about joining the Navy (life lesson: don't try it if you're color blind); and the cartoon Porky's Last Stand, in which Porky Pig and Daffy Duck try and fail to establish a roadside eatery. Next week, Bette and Mary Astor face off for the affections of George Brent in The Great Lie (1941).